The tour companies take riders of any level, from beginners to advanced. Prices per hour vary by quite a bit in some cases, but start at $40 per hour, per rider. Lobster shacks, lighthouses, and beautiful sand is what you’ll see if you book a trail ride with Carousel Horse Farm in Maine. The rides are scheduled in conjunction with the ocean tides, so make sure to plan your day around that. Generally the beach is open to riders only from October 15 through March 31. The minimum cost is $350 for up to 4 people and horses. Plus, you will each need to obtain a permit for $20 per rider from the local authorities. During November and February you can ride Myrtle Beach — and even take your horse into the water, if you want to act out a scene from a movie. A beach ride that lasts about 1.5 hours costs $85. You can ride the Outer Banks with Equine Adventures, with views of the Maritime Forest, the NC Coastal Reserve, and Cape Point. The two-hour ride is available year-round and costs either $100 or $120 per rider, depending on the season. You can pay Two-Bit Stable to take you riding on this beach in the Florida panhandle for $50 per hour, per person in winter, or $60 from March 1 to August 31 (it costs $70 at sunset). Maximum group size is 6 people plus the guide. There’s a $500 fine if horses do anything but walk on the sand. While in Bradenton, book a ride with The Real Beach Horses and you can even go swimming with your horse in Palma Sola Bay, where the waters are warm. The cost is $129 per person plus taxes and fees. Sea Island is home to The Cloister, one of the most luxurious resorts in the nation, and beach horseback rides can easily be combined with kayaking trips. Call for pricing. This beach near Galveston includes beautiful views of the Gulf of Mexico. Beach Bum Horse Rides charges $60 per hour, per person, with a minimum ride of two hours. Picture miles and miles of sand dunes, wildlife, and birds. You can book your guide (and stay) at the Pacific Dunes Ranch. Beach trail rides are $50 per person for an hour, or $75 per person for 1.5 hours. With a Five Brooks Stable guide you can ride through this coastal park over 120 miles of trails that include beaches, mountain tops, and grassy meadows. Guided rides start at $40 per person, per hour. This park is a paradise for horseback riders. It includes 484 acres of trails. 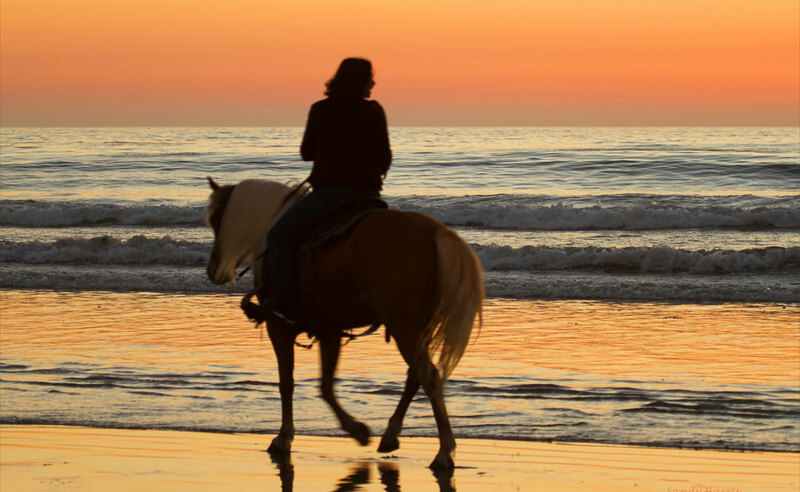 Hook up with Green Acres Beach and Trail Rides in Pacific City. Different rides are geared towards different skill levels. A one-hour ride is $90 per person, or a two-hour ride is $180 per person. They also offer pony rides for kids. On this multi-day, luxury ride over 50 miles of trails with the Willamette Coast Ride from Foothills Farm, you can visit wine country, mountains, and the beach, and taste local vintages and food. The farm is about 1 hour from Portland. Packages include three or six nights, and you have to call for pricing. The Turtle Bay Resort offers rides along the North Shore of Oahu. Rides costs anywhere from $79 to $130 per person, and last from 45 to 75 minutes in general. Is there a beach horseback tour you think we should know about? Leave a comment! Would there be an extra charge for this ? That sounds like fun! I don’t know the answer. I’d pick the place you want to ride and ask them. They may even provide this service — I could see people doing this a lot for weddings and other special events. If they don’t it’s a great business idea!